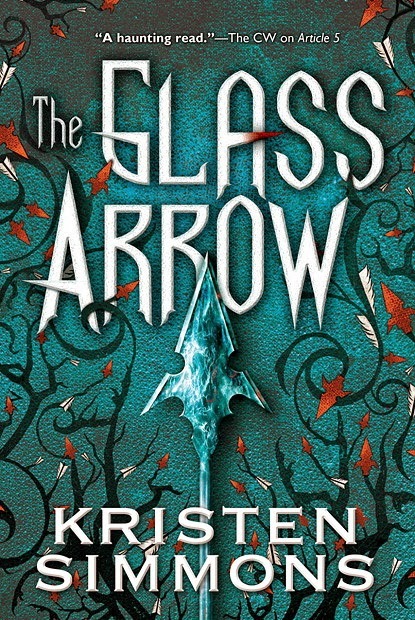 I am thrilled to be a stop on the book tour for The Glass Arrow by Kristen Simmons hosted by Jean Book Nerd! Today, I have an excerpt for your reading pleasure, but be sure to check out the tour schedule below, or click the banner above, to read reviews and more! The Handmaid’s Tale meets Blood Red Road in Glass Arrow, the story of Aya, who lives with a small group of women on the run from the men who hunt them, men who want to auction off breeding rights to the highest bidder. In a world where females are scarce and are hunted, then bought and sold at market for their breeding rights, 15-year old Aya has learned how to hide. With a ragtag bunch of other women and girls, she has successfully avoided capture and eked out a nomadic but free existence in the mountains. But when Aya’s luck runs out and she’s caught by a group of businessmen on a hunting expedition, fighting to survive takes on a whole new meaning. Hi Andrea! Thank you so much for having me! I’m delighted to be here! I'm so excited to have you here with us today! Quick - what are the first five words that pop into your head to describe The Glass Arrow? Fierce, hopeful, auction, family, and wolf. Ooh! That was fun. Thanks. If you could spend a day with one your characters in The Glass Arrow, who would you choose, where would you go, and what would you talk about? I’d spend the day with Aya in a heartbeat. I’d make her teach me how to use a bow and arrow and do all sorts of useful, post-apocalypse things, like set traps and pick berries that aren’t poisonous and build a tree house. Actually, that’s not true. I wouldn’t be able to make Aya do anything. She does what she wants. And so we’d talk about what she wanted, too, because she’s the boss of me. Did you have to overcome any fears the first time you sat down to write? Writing, for me, is staying in a constant state of fear of some sort. I’m ever worried that the story isn’t working, or that I’m not doing the characters justice. At the quarter point I worry that my beginning isn’t catchy enough. At the halfway mark, I’m worried that the middle’s boring. At the three-quarter mark, I realize I have no idea how the end will look and then I finish and go, OMG SOMEONE HAS TO READ THIS NOW. There are obviously great parts, too, otherwise I wouldn’t do it. But yeah, there’s always some degree of fear in writing. What is the most memorable reaction you've had from a reader? If The Glass Arrow had a theme song, what would it be? Hope by Idina Menzel. It’s one of her older songs, but if you haven’t heard it, you must find it right now! It’s so amazing and makes me think of Aya every time! Thanks again for having me, Andrea! Hope you enjoy the book! Kristen Simmons is the author of the ARTICLE 5 series and THE GLASS ARROW (Tor Teen). She loves her family, Jazzercise, and chocolate cupcakes. She currently lives in Cincinnati, Ohio.